There are two facts to owning a large dog. They need a lot of exercise and they can somehow transfer immeasurable amounts of slobber onto their toys. So while it’s fun playing fetch at the park it’s better to take a hands-off approach when it comes to their favorite tennis ball. Enter the Doggie Driver. While it’s not unlike those claw-equipped wands you see most people using at the park, the Doggie Driver uses a golf swing to launch the tennis ball rather than a throwing motion. 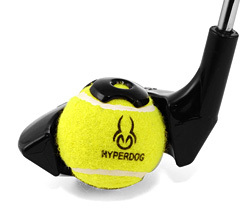 The 100 yard range of the Doggie Driver will definitely tire your dog out but the best part is that you’ll never need to touch the tennis ball when it’s returned to you. To reload the driver just push the opening on the club against the ball and your’re ready to swing away. The Doggie Driver is currently available from Smarthome for $29.99. … and why is it that you can’t just use a regular old salvation army driver? The Doggie Driver is awesome. I just bought one at Petco. It’s probably the best Dog Toy out there. Nice work who ever thought of this one! My hubby loves this toy. It finally is a solutios for him to get out there with our dog. Now they play all the time. The best 30 bucks I ever spent! OK, When you think they thought of everything, someone comes out with the Doggie Driver! Nice job! I now have a way to have fun with my pet and practice my swing in the park. It’s way too much fun!